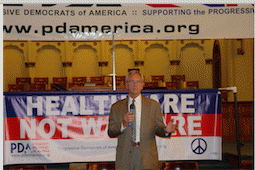 Documentary on Railroading of Don Siegelman In the Works! My guest today is Mimi Kennedy, author, actress, activist. Welcome to OpEdNews, Mimi. JB: You're currently involved in making a film about former Alabama Governor Don Siegelman. Tell us about it, please. MK: The film will be a documentary. Don's in prison, so we can't interview him unless he gets out (we're hoping, but our hopes have been dashed so often, for a pardon for Christmas!). There's lots of archival stuff. Steve Wimberly, the director, is filming interviews and B-roll [supplemental footage] right now. He's an Alabaman and knows the territory. The cumulative arc of specifics in Don's case will make very apparent that political persecution can happen and has happened in the United States, and it will happen again if we empower the bullies even further with civic laziness and a Pollyanna press that doesn't tell us the condition we're in. No matter how "noble" the reason people would like to insure their own victories - saving babies, saving the economy, ending a war) to "disappear" your political enemies is a criminal act that will replace free speech with fear and repression. Don has suffered and few have protested. The story isn't known. Maybe people think, if they hear about it, "All politicians are corrupt - he must have done something." No - he didn't. What he got was a judgment that actually asserted "There is no right in the Constitution not be framed." In other words - yeah, they can lie about you and you can't do anything about it except get expensive lawyers and, good luck. The liars might get away with it. It happens a lot with systemic racial injustice - murder with impunity. Don shows that everyone's at risk - and that his opponents were merciless. This picture is from the day I met him in person after knowing about his case. It was 2008, Progressive Central, Progressive Democrats of America's "alternate convention" in Denver, at the time of the Democratic Convention that was nominating Obama. It was a hopeful time. John Conyers came to Progressive Central - along with Barbara Lee and even Steny Hoyer, who was finally coming around to admitting progressive were the future of the party. And Conyers was Chairman of the Judiciary Committee in the House. He knew about Don and very much wanted to free him - he was ready to stand up to Rove. They subpoenaed Rove in the US Attorneys scandal as part of looking into how Don had been targeted. But Rove never appeared - he's still technically in contempt of Congress. And Don's still in prison. But that day at PDA, I was very moved meeting him. His eyes seemed filled with tears. Mine certainly were. I called him "Governor" - he just seemed to deserve that title rather than the more familiar "Don" at first meeting, or generic "Mr. Siegelman." He's obviously of my generation - the idealism of the sixties. I never dreamed it'd be eight years later and he'd be in solitary for phoning Thom Hartmann. He's in thrall to whatever the prison system wants to do to him; it's really cruel. JB: Hold up a moment, please. I can see that you're impassioned on this subject. But, as you point out, many of our readers have no idea what you're talking about. Can you back up a bit and give us all some background and context here? MK: Don Siegelman was a popular Alabama Democrat who'd won every statewide office, with backing from every voter bloc, before being elected governor in 1998. He won, and backed a ballot initiative for a state lottery to pay for free college for Alabamans. It was opposed by gambling interests elsewhere in the South, for whom Jack Abramoff was a lobbyist. Don was investigated from the minute he became governor, but he won re-election anyway in 2002 - or had until a late-night shift of 6334 electronic votes - attributed to a computer glitch - caused returns in one county, Baldwin, to elect Don's opponent, Bob Riley. Riley's campaign manager was Bill Canary, whose wife was Leura - the federal prosecutor who'd investigated Siegelman. She "recused" herself from the case, but charges were brought anyway in 2004 - and thrown out of court by an outraged Judge UW Clemons. Meanwhile, the paper ballots the opti-scanner glitched on, which might have probed Siegelman's win, were sealed, with threat of criminal prosecution, if anyone tried to count them, by then-Attorney General William Pryor, another longtime political foe of Siegelman's and now a federal judge. In 2006, as Don prepared to run again for governor, he was indicted again, and this time the case was brought before Mark Fuller. Another longtime foe of Don's, he promised to "hang Siegelman" for having investigated him as a county official, years before. His anomalous jury instructions assured jurors they could "infer" bribery of which they hadn't seen evidentiary proof: only heard about it in the testimony of one man who'd been coached 70 times before taking the stand for the prosecution, but the jury didn't know that. Fuller resigned this year from the bench in disgrace as a convicted spouse abuser. Don remains in prison. The entire plot to "take care of Siegelman" has been traced to Karl Rove and the US Attorney scandal whereby compliant conservatives, eager to bring cases that discredited Democrats, were appointed federal prosecutors. JB: Since Don's conviction and incarceration, there's been an outpouring of outrage and support from a large number of former state attorneys general. Can you talk about that for a moment? Why is this significant? MK: When Don's case went to the Supreme Court for an appeal to grant him a new trial because of numerous legal errors and judicial errors - including the charges being accepted in court past their statute of limitations - 113 current and former attorneys-general signed a letter saying Don's "crime" had never before been a crime. That was because the "crime" was one Judge Mark Fuller more or less made up: "inferred bribery." The judge placated the jury about not having seen anything in evidence that confirmed witness Nick Bailey's story about a check he saw in someone's hands on a certain date as the person left Don's office. The amount supposedly in that check was in fact given on a different date from a different source, and would not have fit the facts needed to indict for bribery. So that testimony - which prosecutors coached at 70 meetings, and made Nick write down, over and over, another reason Don's lawyers sought a new trial! - had to be true, even though no evidence came into the trial to support it. Judge Mark Fuller basically told the jury it was okay to believe it was true - to "infer" bribery based on what they'd heard. As the Attorneys General pointed out, and many have since, the crime of inferred bribery puts the guilt in the mind of the beholder without evidence! It is simply a belief that someone is corrupt and done something nefarious for a political donation. Every elected official in our government is thereby guilty - put 'em all in jail. I suppose some maniacs like that idea. But our court system is not for maniacs or we're all lost. That's what I know of that detail. The judge's instructions to the jury, and his acceptance of the case after the statute of limitations had run out on the incident being prosecutable are glaring errors. We know that, since Don's conviction in Fuller's court, Fuller has been arrested for spousal abuse and convicted. A longtime political opponent of Don's, Fuller was investigated by Don when Don was attorney general, for having embezzled retirement funds as a county official. Fuller hated Don, and had promised out loud to "hang Siegelman." The wife, whom Fuller abused in an Atlanta hotel room two summers ago, was his second. She'd been a court employee; his first wife cited adultery and violent abuse when she divorced Fuller, but the court records were sealed, protecting the judge from embarrassment. The abuse of his second wife was instigated by her accusations of him as unfaithful - again, with a court employee. Fuller's a serial abuser and liar, and Don is one of his victims who will be exonerated - but Alabama has proven a tight Old Boy's network, so Don has had to serve his long, unjust sentence. It's an outrage.